Granulocytes are provided as a single therapeutic dose daily, either from an apheresis collection or as multiple buffy coat concentrates from whole blood donors. Granulocytes are prepared for specific recipients and must be requested and arranged with NZBS beforehand. Granulocyte units have a significant number of red cells and platelets in each unit, so a rise in platelets and a small rise in haemoglobin is to be expected. The white cell count and neutrophil count typically does not rise as the neutrophils are consumed at the site of infection and do not circulate for long. Granulocytes are provided as ABO and Rh(D) compatible with the patient. See red cells for more details on blood group compatibility. This product is stored at 20-24°C (room temperature). Do not agitate/shake. Transfuse as soon as possible and no later than 24 hours after collection from the donor. Return to Blood Bank if not immediately used. Febrile reactions are common. Severity is typically rate related - i.e. the faster the granulocytes are administered, the more severe the reactions is likely to be. Use a fresh blood infusion set that has a 170-200 micron filter (standard blood administration set). Bedside leucodepletion is NOT indicated as this will remove all the granulocytes. Similarly, do NOT use a microaggregate filter. Pumps are NOT acceptable for use in granulocyte transfusion. Infuse within four hours. Do NOT administer rapidly. Please take note of the unit's expiry time. Granulocytes and buffy coats expire 24 hours after collection. Allowing for time to test, process and transport the components, there may not be many hours left in which to administer the granulocytes. 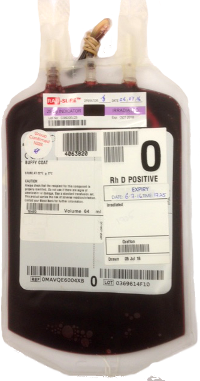 DO NOT use Lactated Ringer's or other balanced salt solutions that contain Calcium, as this may induce clot formation in the blood bag and / or administration set. 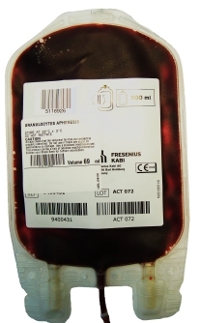 More than 1 x 1010 granulocytes per transfusion (or 2 x 108/kg in the case of a paediatric recipient). This may not always be possible though.